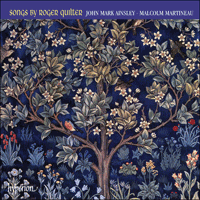 Roger Quilter was a writer of songs, and virtually nothing else (there was an opera, a couple of ballets, and the once well-known A Children's Overture). He composed over one hundred songs, at least half of which remain in the repertoire, loved by performers and audiences alike. This popularity perhaps arose in the first place from the absence of great technical demands being made on the performers (or intellectual ones on the listeners), but the fact that this popularity has never waned owes everything to Quilter's individuality: the addictive qualities of his vocal lines and his uniquely involved accompaniments. This recital includes three of the four sets of Shakespeare Songs, as well as the perennially popular 'Now sleeps the crimson petal' and Quilter's acknowledged masterpiece, 'Go, lovely Rose'. The ‘Three Shakespeare Songs’ were composed in 1905, the first and most successful of Quilter’s seventeen settings of Shakespeare’s words. Come away, death shows Quilter’s ability to adapt the phrases of his music to suit the stress of the words; the two verses are nearly strophic, but not quite, and the climax appears on the word Shakespeare surely designed for the purpose, ‘weep’. Warlock’s comment on O mistress mine is given above and perhaps balances Trevor Hold’s opinion (expressed in his excellent study of Quilter’s songs: The Walled-in Garden, Thames, 1996) that it ‘is the weakest of the set … the worst flaw is the quite unjustified repetition of the opening line of the poem’. A possible justification can be to use this repetition to show the singer’s realization that his light-hearted remarks are only too true, and that ‘what’s to come’ really is unsure. The final cadence, far from being ‘excruciatingly sloppy’ as Trevor Hold would have it, is for some listeners at least an expression of resignation at the transitoriness of joy. The third song is more straightforward, save that the mood of the poem is not. Is it defiant, miserable, cheerful, or what? Quilter manages to make all these interpretations possible in this rhythmically powerful setting. The ‘Four Songs of Mirza Schaffy’ were published in 1903, with translations from the German of Friedrich Bodenstedt by Walter Creighton. They were re-issued, with the accompaniments somewhat revised, and a new translation by R H Elkin, in 1911. Schaffy (Mirza merely means ‘man of letters’) was a schoolmaster in Tiflis, Georgia, with whom Bodenstedt studied languages. The poems were published in 1851 as Die Lieder des Mirza Schaffy, but in later years Bodenstedt confessed they were his own work. It seems Quilter was not aware of this, since he later published a song with the words ‘translated from the German of Mirza Schaffy by the composer’. The poems were immensely popular, reaching a twenty-sixth edition by 1869. Incidentally Bodenstedt made the standard German translation of Shakespeare’s works, used by Parry in his settings of four of the Sonnets. With these songs Quilter was still trying to find his own voice. There are naturally traces of romantic German lieder, so soon after his study in Frankfurt, and the third song is an excellent example of the drawing-room ballad. The 1903 version of the songs is used here. And the rotten old five-barred gate. As Trevor Hold argues, these things have no place in Quilter’s world of romantic dreams. The Arab Love Song of 1927 is one of the composer’s most exciting and dramatic works, only its comparative difficulty for the performers can explain why it is not one of Quilter’s best known songs. Love’s Philosophy sounds equally difficult but is in fact much easier than the less exciting setting by Delius. It was with this song that Quilter found himself as a song writer, and while no one can doubt that Delius was the greater composer, few could argue convincingly that Quilter was not the better composer of songs. Music, when soft voices die was written in 1926. The 'Five Shakespeare Songs' was Quilter’s second collection of Shakespeare settings, published in 1921. The set of four appeared in 1933 and two more in 1938. As always, they are gratefully written, easy to perform, sing and hear, but they break no new ground, and might be compared to Hollywood’s habit of repeating successful formula films, giving them the same title with numbers attached. It is perhaps unfortunate for Quilter that the first and fourth of these poems have been given unforgettable settings by Finzi and Warlock, respectively. Now sleeps the crimson petal has been a favourite among singers ever since its publication in 1904. It is a drawing-room song raised to a higher plane by its sensitivity to the words, resulting in flexible barring rarely seen at the time. It has been republished so many times that the revisions which took place have not been dated, and indeed may not have all been made at any one time. They are mostly minor alterations in the accompaniment, but there is one important change for the voice. Originally, as in this recording, Quilter wrote ‘slip into my’ to four semiquavers (ad lib); this was later changed to ‘into my’ to three triplet quavers. As so often when an artist returns to earlier work to improve it he in fact does more harm than good, and the original version of this song is without question better than the new one. Go, lovely Rose (1922) is Quilter’s masterpiece; a wonderful love song, both words and music continue to yield new beauties over the years. It can hold its head up in any company, being worthy of comparison with the best songs of Schumann or Brahms, yet showing clearly Quilter’s totally distinctive tone of voice. A last year’s Rose of 1910 is a more routine piece. While the ‘Four Child Songs’ (1914), with poems taken from R L Stevenson’s A Child’s Garden of Verses, may not be up to the standard of Edward German’s excellent Just So Song Book, the publication of a revised version in 1945 suggests that many have found these songs attractive. In line six of A Good Child Quilter has altered Stevenson’s original words from ‘sleepsin-by’ to ‘sleep again’. The 1914 version has been used for this recording. To whom your heart was soon enchained. Full soon my place he had obtained. And we were out and he was in. To choose you for my best beloved. Two days before it was begun. It must be admitted that the ‘Four Shakespeare Songs’ of 1933 are rather routine Quilter. Who is Silvia? has charm, but little excitement, and cannot compare with Finzi’s setting. When daffodils begin to peer is a reasonably cheerful spring song, though with no suggestion of Autolycus, the ‘snapper-up of unconsidered trifles’, about it; nor does it appear that Quilter understood the implications of ‘me and my aunts, while we lie tumbling in the grass’! Sigh no more, Ladies is appropriately cheerful, though with little individual character. How should I your true love know? is a different matter, its gentle modal inflections conveying the mood of sorrow shared with an emotional depth only matched by Quilter in his earlier setting of Autumn Evening. It is worth noting, in relation to the first verse, that cockle-shells were worn by pilgrims to the shrine of St James of Compostela, and that ‘sandal shoon’ are sandals, also worn by pilgrims.